Leeds is a splendid city. There are many things to see and to do within the city itself and going a little further afield to the outskirts takes the traveller to even more fabulous places. But today, we’re staying in the city centre itself. We start by shopping in the wonderful covered market that is an architectural feast for the eyes (both inside and out) which is a great place to find bargains. And there’s historical interest too. It was built in Victorian times and it was where the famous Marks and Spencer started trading in 1884. Leeds has some of the best dining options I’ve ever encountered. But for this shopping trip, we’re going to Whitelock’s, a nearby pub, for lunch. Because this is a Leeds shopping tour that has a historical bent to it, we should dine in the oldest pub in Leeds. Whitelock’s, just a short walk from the market, is the oldest pub in Leeds. It opened in 1715. If you’re visiting the Uk from the United States, it will probably amuse you to have a locally-sourced, delicious lunch in a pub that’s older than your home country! The ingredients for your lunch here are mostly purchased from … guess where. Yes, the Leeds Market on Kirkgate. See the menu here. And see the video below – the place can get quite lively. Now it’s time for some posh shopping. We did our bargain hunting this morning in the market and now it’s time to visit some iconic English stores such as Harvey Nick’s, Penhaligon’s, Jo Malone and so many more. 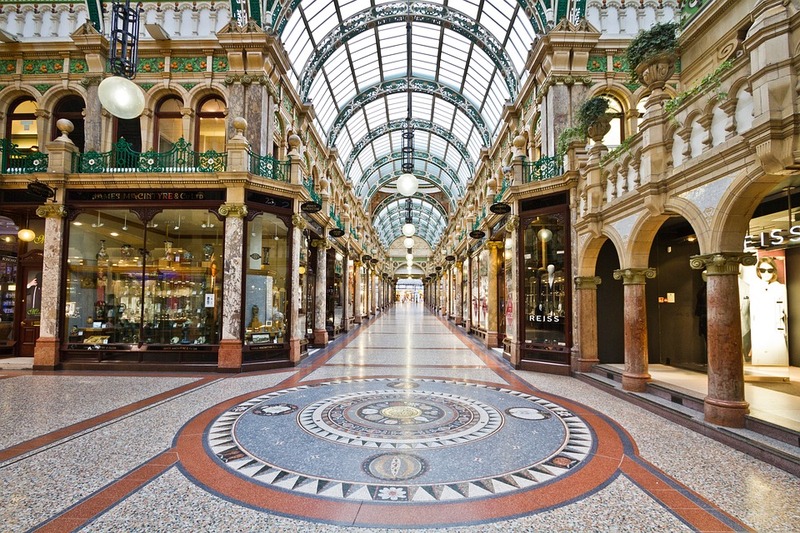 They are located in the Victoria section of Leeds City Centre in incredible locations formed by the astonishing shopping arcades that date from Victorian days. In addition to the fabulous shops, there are plenty of places to enjoy afternoon tea or, if you’re shopping til you drop, a full gourmet dinner.